Known for pioneering the independent rap business and paving the way for indie powerhouses such as his friends at Cash Money and No Limit Records to flourish, few rappers have the longevity or influence of Vallejo, California’s E-40. Now, he is re-connecting with his cousin and one of his earliest musical collaborators, B-Legit, for a full-length album, a first in their 30+ year history as partners-in-crime and in-life. They will release Connected & Respected on April 6th. 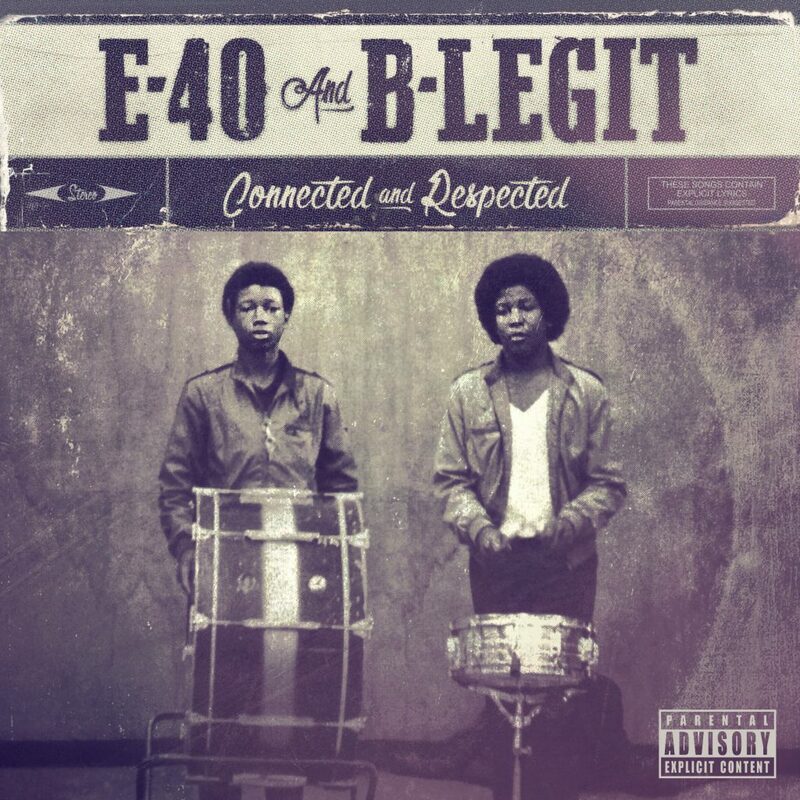 Displaying the chemistry they’ve perfected since the Reagan era, 40 and B-Legit form a brilliant ying and yang, with B-Legit’s basso profundity grounding E-40’s wordplay and elastic flows. Featuring an album cover boasting a photo from their junior high school band days, (“waaaaayyy before Pro Tools and Logic,” – E-40), the album delves deep into the rappers’ extensive history together, emphasizing lessons learned over a hard career–most notably: blood is thicker than water. Featuring appearances from The Click, P-Lo, Rexx Life Raj, Uncle Murda, 4rAx of The Mekanix, Stresmatic, JT the 4th and others, Connected & Respected arrives on April 6th via Sick Wid It Records. Growing up in Vallejo, CA, Earl Stevens (E-40) and Brandt Jones (B-Legit) were inseparable from a young age, developing a close friendship and creative partnership strong enough to last decades. Stevens and Jones used their street smarts to turn a negative situation into a positive, playing together in the junior high school marching band, rapping, and earning enough money to get by. In 1986, B-Legit was accepted to Grambling State University in Louisiana, and 40 followed, fearing that he would go down a dangerous path without his cousin and confidante. At Grambling, the two became campus celebrities when they won a talent show, creating a rap version of the school’s alma mater song. Inspired, the duo moved back to Vallejo to pursue music full-time. Keeping their ambitions in the family, Stevens and Jones recruited Earl’s brother Danell (D-Shot) and sister Tenina (Suga T) to form MVP, a new rap group. By 1992, the group refashioned itself as The Click, hustling their way into becoming one of the most popular acts in rap, selling more than 200,000 copies per release and securing a distribution deal with Jive Records for E-40’s Sick Wid It Records. Though The Click dropped its last album in 2002, B-Legit and E-40 remain close friends and collaborators, frequently guesting on each other’s tracks. To accompany the album announcement, 40 and B-Legit share “BOY,” a boisterous new video single. Explains 40, “A BOY is a pillar, powerful, someone who can knock fools out the way, someone who is a somebody.” Produced by and featuring HBK Gang maestro P-Lo, “BOY” is a slinky slapper, with B and 40 trading short and sweet verses over an effortlessly funky bassline and syncopated handclaps. Rhymes 40, “Homie stay heated, I’ll knock the meat out your pita.” The video finds the rappers presiding over a dance competition, with E-40 shepherding the black team, B-Legit leading the white team looking like a college basketball coach with his clipboard, P-Lo acting as cruise director on the dancefloor, and a memorable appearance from the Jabberwockeez. “BOY” is E-40’s first video since “Straight Out The Dirt,” which featured appearances from Yo Gotti and YoungBoy Never Broke Again. Known for pioneering the independent rap business and paving the way for indie powerhouses such as his friends Cash Money and No Limit Records to flourish, few rappers have the longevity or influence of Vallejo, California’s E-40. Now, he is re-connecting with his cousin and one of his earliest musical collaborators, B-Legit, for a full-length album a first in their 30+ year history as partners-in-crime and in-life. They will release Connected & Respected on April 6th.